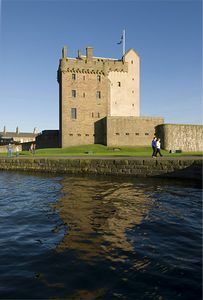 Broughty Castle sits imposingly at the mouth of the River Tay. Built in 1496 on a rocky promontory it has faced many sieges and battles. These have left their scars, with marks made by cannon shot still visible. During the 18th Century the Castle fell into ruin to be rebuilt in the 1860s as part of the coastal defence system. Spread over 4 floors, the museum houses fascinating displays on the life and times of Broughty Ferry, its people, the environment and wildlife that lives close by. On the first floor there is a small shop selling a variety of gifts, cards and souvenirs. There is also a small refreshment room with a view of the River Tay. A favourite with visitors is the lookout post on the top floor of the Castle, which is kitted out with binoculars, where you can view the stunning Broughty Ferry Beach, with the added bonus of spotting some dolphins in the Tay during the summer months! Level 2 features a small art gallery containing a selection of paintings from the Orchar Collection. The Collection was owned by James Guthrie Orchar, one of Dundee's most prominent businessmen, and is regarded as one of the most important Victorian collections of Scottish art in the country. The display also includes some 20th Century paintings by Alec Grieve, Philip de Laszlo and James McIntosh Patrick. 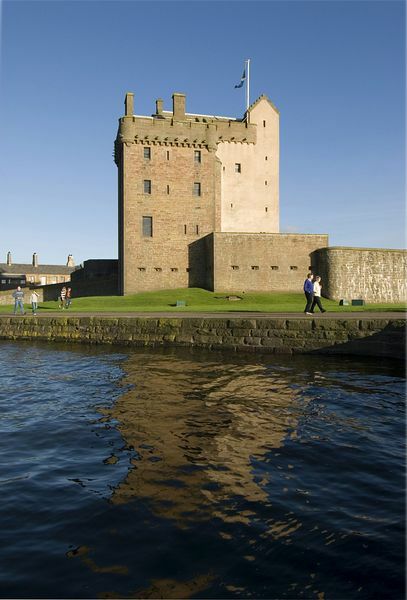 As a fortified and listed building Broughty Castle has very restricted access for people whose mobility is limited. Due to the spiral staircase, we regret access for wheeelchair-users is not possible. Located 5 miles east of Dundee city centre. Follow the A930 and signs for Broughty Ferry. The Castle is located on the sea front at Broughty Harbour.